Last week, I was hitting the afternoon slump–the time of the day when, if I look at the napping cat for too long, I tend to join her. Instead, I pulled the concentrate out of the fridge with high hopes. Lately I’ve been too lazy (seriously, so lazy) to make simple syrup, so I’ve been substituting with agave syrup. It’s surprisingly good! I’ve been drinking iced coffees in the mornings and in the afternoons thanks to the conveniently chilled bottle in the fridge. And at $7.99, it’s done wonders for our coffee budget (which includes constant trips to Panera, Dunkin Donuts and Caribou throughout the week!) 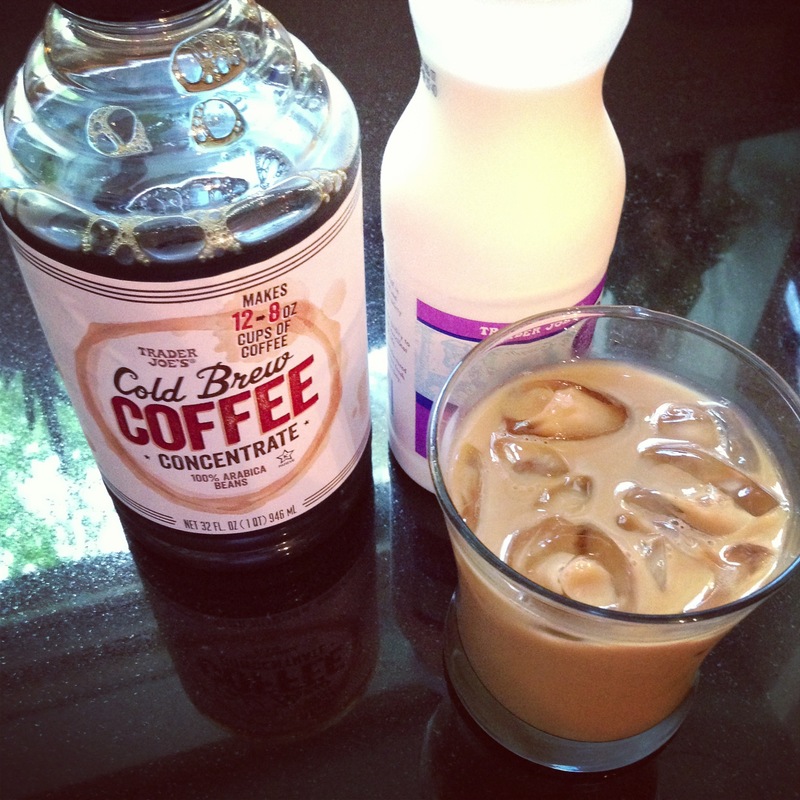 And it’s made us curious to try making cold brew of our own…one of these days! Cold brewing is SO easy that you’ll kick yourself once you do it for not having done it sooner. I use my French press for it, but you don’t even have to do that. If you haven’t a French press, just put your coffee grinds and cold water in a jar together, shake it up, and stick it in the fridge for four or more hours (I leave mine overnight to have coffee in the morning). When you’re ready to drink it, use a rubber band to hold a coffee filter over the mouth, and then pour the iced coffee through it. Easy peasy! Not that I’m NOT going to try this coffee concentrate deliciousness, though. I get lazy. OK…that’s just too easy…and we do have a French Press…We are seriously so lazy, buying our coffee every day. But YES, give this a try…it’s really mellow, but it really packs the caffeine! You can buy the proper brewing system for cheap. Just google it .Toddy sells the most affordable. This is supposed to be at least a 12 hour brewing process, with an additional “dripping into the jar” time. The point of it being brewed this way is so that a good amount of the acidity is taken out of the coffee and doesn’t upset your stomach as easily, but you still get a nice, strong, smooth flavor. Yes, it really is so easy to make and so delicious. I will start doing this again in the summer as well as sun tea. I’m not a huge coffee drinker, but I do love this stuff. I straight up mix this stuff with milk, no water. I probably do about a 1 to 5 ratio. 0.5 – 1 tsp Torani vanilla or hazelnut sugar free syrup. I also like it cold. Anyone happen to know what the amount of caffeine content in the concentrate is? Yum…that sounds rich and dreamy! I don’t know about the caffeine content, but when I drink the concentrate coffee, it definitely feels like more. I’m going to ask next time I go into my local TJs.